For lab-quality photo images at home, trust Canon ink cartridges. Canon printer ink is designed to go hand in hand with Canon’s range of home and office printers, for the best images, text and document quality possible. 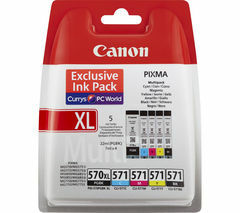 Canon ink cartridges have been created to complement its popular range of Pixma printers. Teaming these printers with Canon’s specially designed printer cartridges means you’ll enjoy beautiful, long lasting print quality. 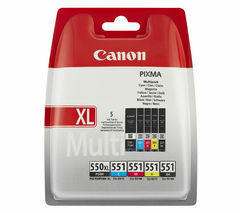 We offer a selection of Canon printer ink that works in harmony with all Canon IP and MG Pixma printers. Available in cyan, magenta, yellow, black and grey, as well as tri-colour and various multipacks, you can always get fresh, cost-effective supplies of the colours you need. Genuine Canon printer ink produces brighter, more accurate colours, for realistic and vivid skin tones. Its black ink produces the crispest, clearest text and fine lines. Its ChromaLife100, ChromaLife100+ and Lucia inks ensure images are resistant to fading, for prints that last a lifetime. Using inks specially formulated for Pixma printer’s FINE print head technology means you’ll get more life from your Pixma and maintain print quality for longer. Top up your Canon printer with our Canon ink cartridges. For HP printers, see our HP ink range, and see how much you can save with our multipack printer cartridges too.